This weekend, I’m writing a third draft of something I thought was already done. And these rewrites have been major ones. Something very important as a writer is remaining positive, and even more important is to just keep plugging on. I was stuck. Before I could put this third draft together, I had to figure out how to just take the second one apart. Then I remembered the approach that gets me through any challenge: look at it as a puzzle. It’s only a puzzle, and I’m smart enough to solve it. I’ve made loads of progress this weekend; I thought I’d take a break and post something that my progress has inspired me to share. Whether it’s a project I’ve imposed upon myself or an obstacle that’s suddenly imposed itself upon me, there’s nothing I can’t solve as long as I see it as a “puzzle.” This segment from my travel book (working title, Nonstop, Endless Connections) captures that sentiment in an amusing way with the tale of my blundered arrival in Frankfurt, Germany. I landed in the morning after a redeye flight, again. After going from Hawaii to Atlanta to Germany, it’s not that I didn’t know what time it was; I didn’t know what century it was. But I was fueled with the excitement of ongoing adventure, primed for Act 3, and I wasn’t delusional about my arrival being simple. I was ready to be lost. I was ready to feel stuck. I was ready to be treated rudely and press on regardless so I could get where I needed to go. Don’t make eye contact? Don’t speak my language? Hate me because I’m an American and prefer to see me dead rather than help me? I’m so ready to deal with you. This confidence, this fearlessness, sent me parading off the gangway and into the Frankfurt airport with a stupid grin on my face. You could say I shot out like a ping-pong ball spat from a plastic air gun (in that it was just enough to cause maybe one person to turn their head and mutter, “what is this silliness?”). No baggage claim, and customs was a cinch. I’m here on holiday. I’m traveling alone. Yes, alone. Just for the weekend. Because I found a good deal. Just because. Yes, alone. Yes, I was drinking. Danke schoen. Then the airport got tricky. I followed the flow of people, expecting to pour through the airport past the shops and restaurants and bars and kiosks and find the information desk and the train and all that. But there was really nothing, and before I knew it, I was outside. There were cars, taxis, people spreading about, and my toes on German pavement, which I nearly faceplanted onto as the road was seemingly inches—fine, centimeters—outside the door, and I was most certainly not where I needed to be. Now here was a moment when I could have panicked. I could have felt lost, stuck, and confused. I could have pitched a proper fit, splaying on the ground in a tantrum of pounding fists and heels. And even if I did do all that, when I got over myself, I still would have been standing there in the same pickle, so why not just skip to the part where I realize I’m an intelligent adult and I just need to solve this? When you’re stuck in a situation, consider your options, pick the best one, and move forward. My options were to hail a cab and spend a fortune getting to my hotel; jump on a wrong shuttle and end up in the wrong place where I’d sleep on the street and have my passport stolen; step in front of a truck and just end it all, leaving the undertaker and a cosmetician to deal with the “VW” embedded in my sternum; tap a serial killer on the shoulder and say, “Hey, pal, can you give me a lift?”; or sidestep along the walkway like a guy out on a twentieth-floor ledge and go see what’s behind door number two. Since I didn’t know how to say, “Hey, pal, can you give me a lift?” in German, I opted for door number two. 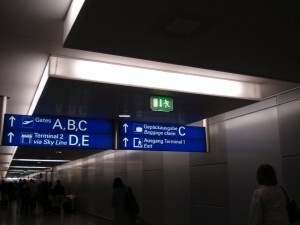 Which was an entrance to another part of the airport. Next thing I knew, I was breezing past shops and restaurants and bars and kiosks. I found the information desk at an open central location rather than stuffed in a wall like at Heathrow, and there were two fresh-faced young German men awaiting my approach. Not only did they both make eye contact, but they even smiled and were pleasant! Per their direction, my backpack and I headed to where the trains board. Rather than there being a person for me to buy my ticket from, there was a little machine I had to stick money into and pick out a ticket. This was definitely outside my ability to handle. I’d survived on these contraptions when I lived on the road. But this one didn’t have the little number and letter buttons that I had to match up with the granola bar and the Fritos. And I needed transportation, not processed malnourishment. I stood there. I waited for a magical solution to drop from the sky; I was even willing to take a concussion if the solution was heavy and hit square. Nothing fell. So I turned around and headed in the direction of help, which, so far as I could tell, was away from the train ticket machine. A half step in front of me was an airport employee. He already spotted me as desperate and/or inept. So he helped me. He took the Euros out of my hand, fed them into the machine, asked me where I wanted to go, tapped a few buttons, and ploop, out came my ticket. Meanwhile, I stood there properly like a five-year-old waiting for a lolli. Yup. So indeed I was stuck, lost, confused, looked stupid, needed help, and took help, and you know what? I didn’t die!